I listened to Johnny Cash’s 1968 live album “At Folsom Prison” this week for lessons I can learn as a songwriting musician. June Carter, Marshall Grant, W.S. Holland, Carl Perkins, Luther Perkins, and the Statler Brothers joined Cash in two performances at the prison. From these live recordings, they selected 16 excellent tracks for the album. While I had some appreciation, I never really cared much for Johnny Cash. A week with this album changed my mind. Cash’s signature “Hello, I’m Johnny Cash.” opens the album. The audience of prisoners dutifully keep silent until he finishes introduces himself, then they cheer. 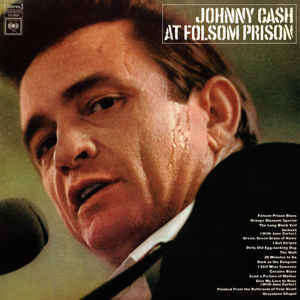 He fittingly starts with the “Folsom Prison Blues” which he had originally recorded in 1955. This narrative country song follows a standard country-blues chord progression of I-I-I-I7-IV-I-V7-I. Cash sings while strums acoustic guitar with a steady rhythm. The bass guitar bounces between the first and fifth note of the chord on each quarter note. A clean electric guitar punctuates with staccato syncopation. This electric guitar combined with the drums creates the railroad train rhythm of the song. The lyrics tell the first person narrative of a man “stuck in Folsom Prison.” Often a song with this setting would have us feel sympathy for the prisoner. However, since this one “shot a man in Reno just to watch him die,” it’s difficult to feel to bad for him. Cash later said that he tried to think of the most evil reason to kill somebody. So, this isn’t a case of somebody being stuck in prison that didn’t deserve it. “I hear the train a comin’ It’s rollin’ ’round the bend” introduces the train. This becomes a major symbol in the song. Cash uses the train to provide contrast with the prison. The prisoner hears the train go by routinely and envisions the passengers having a good time. He could accept his imprisonment were it not for this reminder of what he’s missing out on. The lines utilize an ABAB rhyme scheme. Throughout the song, the second and fourth lines are always end with a true rhyme and the first and third lines usually end with slant rhymes. I also particularly liked “Cocaine Blues,” which is a cover of an old Red Arnall. Cash keeps the hyper tempo of the song, but gives the vocals a more human treatment. The chords travel along a simple I-V progression throughout until the final couplet. The song ends with a I-IV-II-V-I. This song also tells of a murderer imprisoned through a series of couplets. I took a shot of cocaine and shot my woman down. I stuck that lovin’ .44 beneath my head. During the second half of the album, Cash’s soon-to-be wife June Carter joins him to sing “Jackson.” This was a cover of a song by Billy Edd Wheeler. I enjoy Cash’s bit of flirting with Carter before they start the song, as well as her witty response. Much like “Folsom Prison Blues,” “Jackson” drives through a country-blues chord progression. The first two lines of each verse are I—I7, with the second two following I-IV-I-I-I-IV-V7-I. Again, the bass bounces through the first and fifth note of each chord emphasizing the rhythm. The drums also roll along in the background. June also joins along in “Give My Love to Rose” which was written by Johnny Cash. They give an excellent performance at Folsom Prison, but I prefer the sound of the original 1957 single. We see here another chord progression built entirely on I, IV, and V chords. The first two lines of each verse are I-IV-I-I, and the second two are IV-IV-I-I-V-V-I-I. That makes this song a type of country-blues. This first-person narrative is actually a third-person tale. The speaker meets up with a dying man by the railroad track. The dying man had just finished serving his time in prison. He was “trying to get back to Louisiana to see (his) Rose and get to know (his) son.” The simple chorus gently delivers the strong emotion of the story. Give my love to Rose, please won’t you mister. Take her all my money, tell her to buy some pretty clothes. And don’t forget to give my love to Rose. This was a tremendous album that gave me an appreciation for the work and performance of Johnny Cash. I’m ready now to revisit his other material that I’ve written off before. The songs provide examples of great songwriting. They tell stories about unlikely characters that can be appreciated at a surface level; They also present additional layers using symbols and implied meaning. All elements of the performance are there to support the lead vocal, which is there to tell the story. That songs of Johnny Cash “At Folsom Prison” demonstrate how much you can achieve with the most basic elements when the songwriting is strong.